Jenn originally started working for Village Animal Hospital in June 1995. Since then, she has worked as a veterinary assistant, Director of Client Services, and was promoted to Practice Manager in 2002. Jenn enjoys spending time with her husband, her dog Betty the Beagle and her 5 cats! 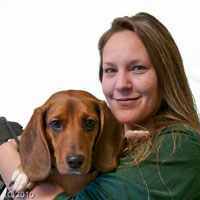 Angie started working in the veterinary field in November 2002 at Village Animal Hospital. She started as a Veterinary Assistant and has worked her way to become the Hospital Operations Manager. Her family includes lots of cats, 2 dogs, a turtle, a corn snake and many chickens! Kathy graduated from Northern Virginia Community College in 1999 and has been with CVH since 2007. She is currently working towards her Veterinary Technical Specialty Certification in animal behavior. Kathy is a native of Virginia with a beautiful daughter, 1 dog and 2 cats. Ashley graduated from Blue Ridge Community College in 2008 and started working at CVH in 2007. She is working on her Veterinary Technician Specialty in nutrition. She has two cats, Jumper and Walnut. Shanna graduated from the Blue Ridge Community College Veterinary Technology program in 2005. She has been working in the veterinary field since 2004 and at CVH since June 2008. She lives in Louisa with her husband, 2 dogs and 2 cats. Emily graduated from Blue Ridge Community College in 2016 with a degree in Animal Technology. She has 2 dogs, 1 cat and fish and enjoys spending time with friends and family in her spare time. Bobbie started working at CVH in 2007 and graduated from the National Business & Technical school with a diploma in Medical Coding. She lives in Charlottesville and enjoys playing poker, taking cruises and hanging out with friends. Kim has been working in the veterinary field for over 10 years and has been with CVH since February 2010. She is owned by two very spoiled dogs and a cornsnake named Maize. Christine has been with CVH since June 2011 and currently shares her home with her husband, 1 cat and her two daughters. She enjoys spending time with her family, watching movies, swimming, and being outside. Abbey joined the CVH team in 2016. She has two spoiled dogs named Kato and Ace and enjoys spending time with family, hiking and doing craft projects. Sarah has been working at CVH since 2010. She moved here from New York and now lives with her husband, their two cats, Zelda and Dobby, and their beagle, Cherry. ​ (cats) and Thelma & Louise (ferrets).